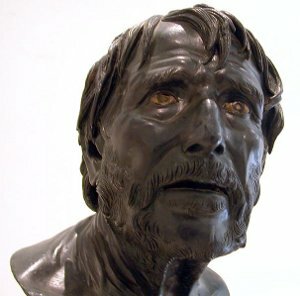 This bust is of Roman origin, and is now thought to be Hesiod. A great poet (or a great tradition of poetry) from Boeotia in Greece, Hesiod’s “Works and Days” and “Theogony” were widely read in the sixth century and remain fresh today—they are the chief source we have on Greek farming, and this book owes an enormous debt to them. Hesiod is thought to have lived from about 700 BCE to 650 BCE. From the time of Herodotus, Hesiod, with Homer, has been thought to have been the greatest of the Greek poets. Where Homer is the poet of aristocratic war, Hesiod in the poet of the farmer and the worker. It is worth remembering (again) that the warriors were farmers—that no man who fancied himself an aristocrat in Boeotia was ever far from the farm or the plough. But Hesiod has a voice like Franklin or Twain—a voice of sense that is scarcely common—and his advice to his erring brother has an air of verisimilitude hard to reach in the high imaginings of Theognis or even Homer.